Each year, the Clinton High School staff, in conjunction with the School Improvement Advisory Committee (SIAC) and our local school board, determines school goals for the upcoming school year. This years goal revolved around increasing what is asked of all our kids at CHS and really pushing them to their full potential. With that being said, it was up to the school to determine how to do that, as well the steps needed to take place in order to do so. Clinton High School has long been known as a model Professional Learning Community (PLC) school because of how we collect data on how our students are doing and act accordingly. We are guided by our Mission, Vision, Values and Goals. In order for us to get the most out of our students, we have to figure out our path to get there. This is where our Vision comes in! How we will achieve our Vision is by our Collective Commitments. These are what we will hold true to when we have to make tough decisions. In the end, we want to be able to reach our Goal. The process was once again followed for this year, because as a school, we wanted to focus on Depths of Knowledge (DOK). Depths of Knowledge really puts the heavy lifting of learning on the students, as they are asked to share their information in different ways and from different angles, as well as being able to validate their reasoning with evidence. The focus for our classroom observations revolve around if there is alignment from what we want a student to be able to and what they actually being asked to do in the classroom. With this focus, we feel we will be able to ask more of our students and increase the rigor for all students! We are looking forward to this journey. 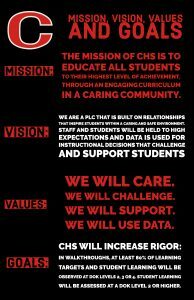 We know if we stick by our Mission, Vision, Values and Goals we will continue to see success for all students at CHS.